Ibn Hajr in Bulūgh Al-Marām wrote a chapter entitled “The Chapter of Hadānah” (or Hidānah). The intent of this term is the protection of children from harm, to establish their cultivation, and to give them the attention and care they are entitled to. 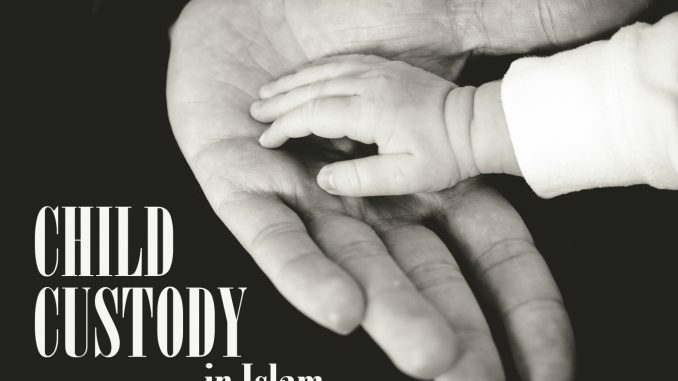 That is because the Islam is a religion of mercy and goodness – children are not left, abandoned or neglected when the mother and father are separated, either by their deaths or through a divorce. So when a couple is separated and they have children, then Islam gives concern to the welfare of those children. The primary carer is held accountable and obligated to give the children their rights so that they are not neglected and left to waste away. 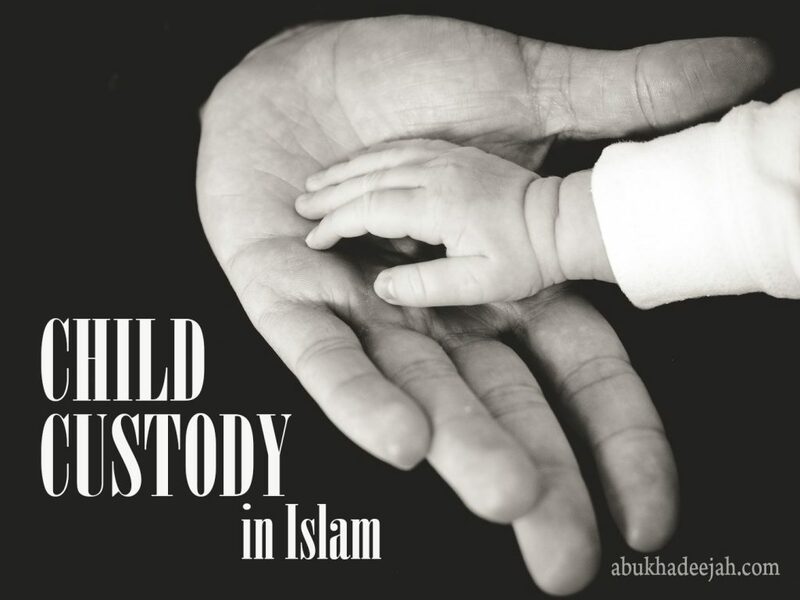 There are many narrations that have been reported from the Prophet (peace and blessings be upon him) that clarify who has the right to custody and care over the children. This is an evidence of the completeness of this amazing Religion because it gives the children the attention that is rightfully due to them, and safeguards them from harm. This itself is a distinguishing feature of Islam. As for non-Muslim cultures, especially in the West, the same concern is not to be found. For this reason, you find the large numbers of children’s homes where young people are left to be wasted away without sound education, cultivation or parental love. Children in Islam are given a great amount of importance. It is not allowed to neglect them, or to abandon them or to hand them over to institutions and homes who cannot or will not give them the rights that are due to them. Unfortunately, in these times, some weak-willed Muslims have begun to imitate and mimic the Western and non-Muslim culture. They have become neglectful and inattentive with respect to their children, putting them under the care of those who have little or no mercy for them – those who have no connection with them. Just as a child has a right to be fed, nourished, clothed and sheltered, then likewise they have a right to be cultivated and educated – and this latter right is even more important. Educating children upon good manners, noble character, well-being and protecting them from harm is more important than food and drink. When a mother abandons her maternal responsibility and hands it over to others: maids, teachers and babysitters, this leads to great harm to children and to their education and cultivation. So parents must pay attention to this affair. If Muslim parents have fallen into these traps of the modern Western society and fallen into neglect, then it is a must that they reassess their responsibilities and prioritise their time and fulfil their rights as Muslim parents. They must not delegate this role to those who will not be merciful and affectionate as a mother will be. If parents do not pay attention to this affair, they will soon find that their children have gone astray due to bad cultivation and the poor morals they are taught by strangers – they may become corrupted by sins or by losing their faith in Islam. And this is an affair that is seen in these times plentifully due to neglectful parenting. These parents who care little except for their own financial wellbeing and desire only that their children excel in monetary terms, not showing concern for good character, good manners, the religion or the Afterlife. So the parents have a duty to cultivate their children whilst they are young. Then when the parents become old, they are in need of the children so they return this good treatment. So children should serve their parents just as they served their children when they were young. However, if the parents wasted their children, neglected them and left their care to those who gave them poor and downright bad education and cultivation, then what is going to be the end result of that? Answer: Children will be bad to their parents, uncaring and ill-mannered and that is the recompense the parents receive due to their abandoning their duty to their children in their early years. So the bad treatment of parents at the hands of their children is more often than not a result of poor nurturing and poor upbringing. One: That the right of custody over a young child is with the divorced mother. That is because the mother will be more compassionate towards him than the father, and more aware of its needs: hygiene, cleanliness, neatness, and overall care of him. For this reason, the Law-Maker (Allah) gave her the right to custody and gave her precedence over the father. This hadeeth proves that women are given precedence over men in the affair of child custody. So the one having the most right to custody is the mother, then her mother, then the maternal aunts because they carry the position of the mother. Thereafter, it is the womenfolk from the father’s side of the family, such as the grandmother (father’s mother), the sisters, the daughters of his brothers and the paternal aunts. Thereafter it is given to the male relatives if the female relative cannot be found. Meaning if women from the mother’s side cannot be found, and women from the father’s side cannot be found, then in that situation custody is given to the males – those having the closest blood ties given precedence. So the man gives the care of the child (baby) to a woman (of his household) who will be good to it. It could be his wife or another woman who will take care of the baby. 1. The women on the mother’s side of the family (beginning with mother herself). 2. Then the women on the father’s side of the family. 3. Then the men on the father’s side of the family (their wives, etc). A man cannot look after a young child or take custody of it, but he can hand over its care to a trustworthy woman who will look after it. Two: If the mother remarries, then she loses custody, and it passes to the next person in line. That is because her main concern now is her new husband. She cannot busy herself with her baby to the disadvantage of her husband — unless her new husband permits that and allows her to hold on to the custody of her baby, then in that situation the right [of custody] remains with the mother. That which prevented her from keeping the baby was her duty to her new husband. However, if he permits her to look after a child from a previous husband, then the right of custody returns to her due to the removal of the preventative barrier (which was the concern of her new husband). Taken from Shaikh Sālih al-Fawzān’s explanation of Buloogh al-Marām min Adillatil-Ahkām of Al-Hāfidh Ahmad Ibn ‘Alee Ibn Hajr al-Asqalānee (Born 773H, Died 852H). Shaikh Al-Fawzān’s tremendous explanation is entitled Tas-heel al-Ilmām bi-fiqhil-Ahādeeth min Bulooghil-Marām and is printed in seven volumes. The above is a translation of this important and very enlightening chapter (from volume 5), adapted in places for brevity and simplicity. NOTE: This article cannot be taken in isolation concerning the laws of custody, as there are two further parts that discuss custody of children as they get older, and enter into the ages of discernment.